Washington D.C. holds a lot of history for me growing up, mainly because my Mom was raised there. It was also the place where she met my father who was working at the Coast and Geodetic survey for the government back in the 1960’s. For most of my childhood, my summers were spent in D.C., but I was too young to really appreciate it. I believe around 6th grade was the time I realized that D.C. was an actual place. I have this fond memory of listening to “Genius of Love” and “Wordy Rappinghood” by the Tom Tom Club in my heavily scratched walkman while the plane circled around slowly into the metropolitan sectors of the city. Being that I was raised primarily in the outskirts of cities in South Carolina, Texas, Tennessee, and Georgia… my brain only comprehended the architecture of lonely roads funneling through the billowing forests of blossoming oak and maple trees. This city was bustling with tight alleyways and streets flooded to the brim with people walking everywhere. The architecture of a city was so foreign to me, and I was completely in love with the idea of existing is such a concrete paradise. This would also be the first place that I’d take my first subway ride, and I remember thinking “I want to be a subway train conductor for a living” (I still am fascinated by public transit by train and still wish to have that job). Well… Washington D.C. still has my heart. This piece, entitled “METRO D.C. POWER”, is a tribute to Washington D.C. In this piece you’ll find EVERY single district floating inside Mickey’s head. The green area represents the parks in the city, while the blue sectors that cut through either side in the middle represent the rivers. The shape sectors represent factors that are important to the locals of the city as well as tiny snippets of personal history regarding my consistent stay there. The lower right hand sector represents my FAVORITE part of D.C., which is the Metro system. Here you will find the lines which are represented by their respective colors and their end stations. Lastly is the Washington Monument and the White House. This piece ends the Metropolitan Collection and resides as number 97 in the collection. This was a re edit from the original “Topsy Turvy” piece, which was unfortunately rejected due to Mickey’s face being upside down in a right side up silhouette. You can find the original in the “Extra” series. Because I loved the idea of everything being backwards and the story attached to it, I resubmitted it with his face normal, but the background still being similar. Here is the original post. “Disorientation is the feeling I experience the most in regards to “The Human Condition Series”. I’ve been confused for a large portion of my life as understanding and keeping the information of things learned has always slipped my grasp as a kid. My brain had the hardest time retaining facts and information when I was young, and I always felt like I was spinning in this upside down spiraling void whenever asked to repeat, recite, or simply remember anything. I used to think that inside everyone’s body was a house. Inside your feet were the basement and rec room, the legs were the study and exercise rooms, the stomach was the kitchen and dining room, the chest was the living room, and the brain was your own bedroom of sorts. Everyday I’d walk around staring at people trying to figure out what their house looked like from the inside, and automatically would associate their personality to the state of their house. The wacky would have funky houses, the prim and proper would have cookie cutter duplexes, and sad and disheveled would have empty and lost rooms awaiting furniture. Looking inside my own self, I imagined that all the furniture was on the ceiling, and that magazines, coffee cups, and random flotsam and jetsam floated about the room with no gravity, aimlessly clinking into each other with no means of ever settling. All the paintings were backwards, and everything was in a consistent state of how I liked to describe to people as “upside-down-ness”. I suppose this was some kind of coping mechanism to relate to the world that I had attention deficit hyperactive disorder, and had severe learning disabilities in both math and science. When teachers would ask “Why can’t you understand this?” or “Why aren’t you retaining this information”, I could only reply that everything in my head was “Topsy Turvy”, and/or more specifically “That none of my furniture is on the floor in my head”, to which would promptly get me sent to the school shrink for my metaphors (which was common). I think for a lot of my life growing up in the microcosm of the school system in Georgia, my ability to relate to people on an educational level, let alone, a social level, was met with great obstacles, due to my inability to retain information. I was always in this state of confusion due to the mass amount of information being fed to me on a daily basis. In essence my imagination was a deterrent to me understanding anything, and therefore became my worst enemy. With that being said, I was always “TOPSY TURVY”. I was heavily insecure about this, even after being retested in my senior year and being rebranded as intelligent, heck.. EVEN after becoming an algebra tutor to my peers in college. .. I still had this lingering aftertaste of being inadequate and slow to the world. That feeling of confusion, being overwhelmed, backwards, upside-down.. still floated around softly in my skull tepidly whispering its potential of return. Occasionally in my late twenties and thirties working in business/corporate, I’d be reminded of its ghost, and I’d give it little refuge for establishing itself in my head. It wasn’t until I fully realized that this confusion, this disorientation, … was more of a sensation from stifling my imagination and creative abilities. When I was discovered as an artist, my ideas emptied out of my head like a burst dam. .. YEARS AND YEARS of dreaming, thinking, drawing, sketching, … previous actions which were hinderances to my learning development, were suddenly rewarded by my quirky and weird thought processes. I wasn’t a failure. I wasn’t slow. In fact, there was nothing wrong with me at all. I just happened to be a human being meant for different things, things that required different thought patterns and different approaches. I was an artist. That was really it in the end. During the Winter out in Chicago, I nestled myself in my 5th floor apartment at the Envoy building out in the Bryn Mawr Historic District. I would spend most of my time indoors, often never leaving for days.. all the while my radiator quit working, and I would end up utilizing this old electronic heating fan while wearing three layers of clothes .. rubbing my hands together consistently .. while painting for endless hours in the cold days and into the even colder nights. At this point it had been weeks that my drafty minuscule apartment had lost radiator heat, and despite the cranky yet well meaning maintenance man, nothing seemed to work. I began to go a little crazy into the ending weeks of February.. and decided to use that madness for a piece in the 10x10x10 collection. I began listening to any kind of music that made me feel warm. One genre in particular, called “Vaporwave”, whistfully blared over my speakers into my cold apartment… often transporting me back the warm 80’s aesthetics of Miami and Los Angeles. I began to remember my time in Miami when I’d float through South Beach while touring art schools in the mid nineties.. and decided to focus on the 1980/1990 geometric aesthetics of Memphis-Milano and infuse that with white sketch patterns over cool colors of lilac and aqua blue. While painting this, I felt transported out of my igloo of my apartment, and back into the nostalgia Commodore 64 / IBM days of a digital world on the brink of discovery. This piece is called Tokyo Ocean Drive 1983. Tokyo represents the 80’s digital era, while Ocean Drive reflects the warm summering days of Miami during the revolutionary aesthetic times of 1983. This comes as number 88 in the TENxTENxTEN collection. Music was the bright eyed and determined captain of my ship out in the rocky waters of my youth out in Marietta, GA. Whether it be the turbulent carpeted seas of my home, or the tsunami of backlash form my peers.. I often sought to lay in my bed and stare at the ceiling while listening to Kate Bush and wait for the storm to end. In my ears, the siren like sounds would guide me out of my enclosed padded cell of a head, and out into the lush fields of a world yet undiscovered. Later on, in my teenage years, music became less of an escape, and more of a soundtrack to a life that I learned to control. Through the linear path of my first romances, to my struggle to identify why I was such an outsider among my peers.. Music was this answering pathway to my present and a beacon to carve out my future. In originally doing the mixtape piece, which was entitled “Rewind the Future”, the mixtapes were originally based on the core characters of Disney. The tapes were labeled with “Goofy’s Glamrock”, “Minnie’s Motown”, and more… and these pieces focused on merging 80’s nostalgia with the love of Disney characters. While I was super happy about this execution, I decided to go back to make this piece a little more personal.. much like the Loveless Letter’s Series. I was back out in Athens at the time in December of 2014 interviewing for my MFA at the University of Georgia. It had been a while since I had been back to a place that I previously lived, and the sights and sounds of my old stomping grounds began to sweetly haunt me with flashbacks of my teenage years. It was here out in Athens, where music was the most important to me. .. as it was here that I ran away from home at 17 from the parking lot infested suburbs of Atlanta, and out into the deep molasses thick humid forested South of North Eastern Georgia. I was a mess of emotions from leaving home, and consistently had my headphones on while I got a ride to and from work. Sometimes, I couldn’t get a ride home, and would walk 7 miles down from the 2300 block of Broad Street (HWY 78) to an apartment off of Cedar Shoals Drive on the East Side. Don’t get me wrong, I didn’t hate the walk whatsoever, and in fact preferred to walk 2 hours with my walkman blaring different sounds that I loved. It was a chance to get out of my head, clear my weird path, and wonder about the strange and different future of a freedom I didn’t know how to handle. 20+ years later, here I was, back after my time out on the Northeast, Midwest, Pacific Northwest, and the West Coast… and all those memories came flooding back. I arrived with unfinished Mickey’s rolled up and poking out of in my backpack like a deranged man with a bagpipe strapped to his back.. The last time I was here… REALLY living here, was back in those days when music was my savior.. and I went back to all those mix tapes that I made as a kid… and they were like entries in journals masked into sound, with intricate details of little stories drawn on each cassette. . I decided to take these cassettes, and went through a youtube rabbit hole per se, while recreating a new Mickey based off of the time when music was my greatest saving grace. This is the last of the Children of the 80’s series, and is number 87 in the collection. Out in San Francisco in 2001, even before I attempted at being an artist again, I worked out in a restaurant near Union Square. I’d spend my nights working in this tourist trap of a corporate food haven, hang up my apron, and head home 7 blocks to my apartment in the densely packed part of the Tenderloin. I lived in a walk in closet for $447.50 dollars a month, which laid on the 5th floor off of Geary Street. The great thing about this place, was our apartment was on the top floor, and outside our window laid the fire escape that led to the rooftop. A fellow waitress of mine was one of my favorite people in the city. Her name was Carol and she was from Rio De Janeiro. Often, she and I would close together and we’d grab our shift meal from the restaurant, walk up the hill to my building, through my apartment, and up on the roof. She’d tell me about her home in Rio, and teach me Brazilian Portuguese while we would lay watching the fog roll downwards into the South of Market District. She’d say “San Francisco is my heart in America, this building reminds me of home” and then would talk about her adventures out in the discotheques and her job that she had on the beaches of Ipanema. It was here where I fell in love with the culture of Rio through her stories, and became obsessive about learning about the city. Thirteen years later I ended up on a clothing line project for a swimwear company that asked me to be their lead artist for the 2016 Summer Olympics in Rio De Janeiro. I ended up studying again on Carol’s city, often nostalgically remembering our conversations and the lost connection I had with her after she left back home. I ended up moving from Las Vegas and out to Chicago, where I would spend the cooling autumn months in my tiny apartment to configure these designs… and I was left with such a void, as my concentration was just with the city of Rio. Fast forward the completion of the project, and into the Spring… and I was to move again, this time back home to Georgia in a small town called Athens. I just finished “Know Where”, a Sketchwave series piece that went over my time at Comic-Con in San Diego to my travels back home in my temporary summer sublet off of Easy Street in Normaltown.. and recollected on where I felt a void in my storyline. Brazil was my void, and it was perfect because I was two shy of completing the “Around The World Series”. I sought to fill this artistic gap by just not talking about Carol’s city, but the entire country of Brazil. It was here where I created the piece “Bem Vindo Ao Brasil” (Welcome to Brazil), and went through, piece by piece about this country. In this painting, I have created anchor spots for the two major cities, Rio De Janeiro, and São Paulo. In Rio you will see major points to the city like Avenida Atlântica, Carnaval, Corcovado, Banco Do Brasil, and Pão De Açucar. In São Paulo you will notice Avenida Paulista, Higienópolis, Bela Vista, MOOCA, Rua Augusta, and more. The beaches of both Ipanema and Praia Grande rest above these cities as well. In the green portions you will see the major forests of Brazil such as Passaquatro, Xie, Caxiuanã, Taragua, Amazonas, Xingu, and others. In the black of Mickey’s ears are other cities of Brazil like Belo Horizonte, Fortaleza, Curitiba, João Pessoa, and more. Above the Mickey head is the country flag of Brazil which states “Ordem E Progresso” (“Order and Progress”). Of course, finishing this piece while satisfying my curiosity through basic research, only opened up a larger gap of what I long to learn. I hope in the future years I’ll be able to visit the various towns of Brazil and fully appreciate not only my painting of the piece, but the stories of Carol which were told on my rooftop those lovely fall nights out in San Francisco so long ago. In Chicago I lived on the 5th floor of a building called “The Envoy” on the Northside of town called “Edgewater”. It was a hardy brick building that dripped with a deep history beyond a century. Before me laid over a hundred years of people living in this room. It was a tiny box apartment with heavily textured walls, and often when I’d graze my hands across the sea of fluctuations of texture, I wondered how many people had done the same before me. My window overlooked the north side of town, which carried the view of an adjacent rooftop, that at night would blow massive puffs of steam into the cold air, like a blues singer arching their neck upwards to blow their cigarette smoke while singing. Beyond the roof top, laid a mass of buildings checkerboarding their lighted windows across the way. I’d lay in bed and watch the various characters criss crossing through rooms.. some were cooking, some were fighting, and some were falling asleep alone to the lullaby of their television at 2am. I worked furiously in this apartment, often forgetting the idea of sleep while my hands were so desperate to create something. I had previously spent 8 months in Las Vegas, and while fruitful for business, my brain shut down from the loneliness. When I had arrived in Chicago, my mind was on fire, and like a floodgate breaking, I spent most of my time painting. I was still being reclusive, but I never felt alone, and in fact… it was the first time in a VERY long time, that I felt alive. we are just happy where the current takes us. Chicago had become the first place where I felt like I belonged. Suddenly my circle self fit into a circle city, and I settled quietly as the winter came. The cold blazed through the town, and there were minor complications with my water and heating system, but with that aside, I found that the friendships I had, made me completely blind to the harsh weather that came over me. During the Winter I spent my days working in the studio, and in the evening I’d walk out of The Envoy and down Bryn Mawr slipping on the ice patches to Clark and work at a warmly lit restaurant called “Summerdale” till close. Generally I’d walk back the same way, or grab the train at Berwyn and ride with one of my Mickey paintings down to the 24 hour diner off of Belmont and paint till the wee hours of the morning while it snowed outside. I’d eventually go home, and fall asleep to the sounds of CTA train whizzing by, and wake to the sounds of the cathedral bells telling me what time it was by the number of icy chimes that rang. As Spring came, I realized that I wanted to move away from Chicago back to Georgia where my search for home started. I figured it was the perfect way to close the TENxTENxTEN series. I found it difficult to leave my apartment, and on my last day I hysterically cried in my taxicab on the way to O’Hare International Airport to my new destination. It was the first time in my life that I have ever cried about leaving somewhere. Because it was the first time in my life that I felt like I was leaving home. This piece is called “Objects in Chicago are Closer than they Appear”. 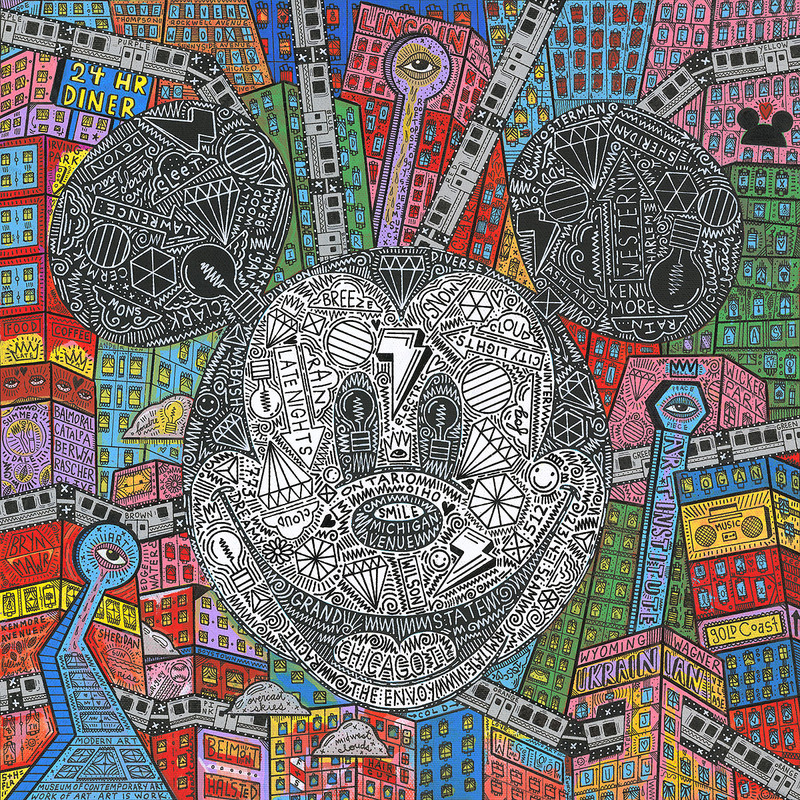 In this painting Mickey is surrounded by the districts, train lines, museums, and icons of Chicago. Inside Mickey’s face is a representation of streets, beaches, and parks of the city. It resides in the “Sketchwave” series, as “Metropolitan Daydreamer” is technically the piece that resides in the “Metropolitan Series” representing Chicago. It is with this piece, that I tell you, that I love you Chicago, and this is painting is my love letter to you. You are the first place in my life to call home, you are the first place to give me such radiant joy, and you are the first place where I can feel love. I love you in your temperamental temperature ways, and I love you when you throw your cold winter shoulder away from me, because I know you’ll turn around eventually and give me your warm spring and summer embrace… and when I ride home on your trains with my paint stained hands and tired eyes, know that I am tired because I want to be awake more than I want to sleep when I’m around you.